"Make no mistake about it - this is a very, very good golf course!" - Jim Flynn, Pros N' Hackers Magazine. The Lee's Hill championship layout is a masterful mix of natural parkland and strategic holes. This enables you, on several holes, to find the amount of risk/reward you want to take. Water plays a direct role on six holes and lurks in the background on several more. A straight forward, classic design. #1 is a good starting hole with trees crowding the right and trouble left. Get your tee shot in play and start your round with a par. 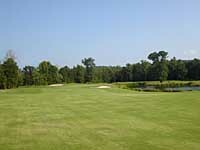 #2 is a fairly open par 5 that plays long and simply says "use good judgement here". #3 is a shorter par 5 of only 510 yards from the back tees. #4 is the #1 handicap hole and a tough par 4. Big hitters can challenge the right side on the tee shot and cut off some of the dogleg. #5 may be one of the more interesting par 3s in the area. It's short and it's mean. Only 150 yards from the back tees, the green is beautiful, but has a narrow depth. #6 is the first real breather on the front side, only 357 yards from the back. #7 is a very challenging par 3 - 209 yards from the back tees, obviously long, but pin placements will make a huge difference in the shot required. #8 is just a beautiful par 4 with a dogleg right and slightly elevated green with a lot of contour in it. #9 is a short par 4, but don't relax too much, strategically placed greenside bunkers make your angle of approach important. Now, let's make the turn to the back nine. #10 is a medium length par 5 that allows the longer hitters to go for it, while shorter hitters should use prudent layup strategies. #11 is another short par 4 that rewards shotmaking and good wedge play. #12 is a popular favorite for many golfers, a beautiful par 4 with a large pond running almost the full length of the hole on the right. #13 is a moderate length par 4 of 386 yards from the back, giving you a chance for birdie. #14 is another great par 3 and is generally considered as the signature hole of the course. Your tee shot is over a natural wetland to a two-tiered green. The next hole, #15 is a controversial one. Standing on the tee, you'd swear the hole goes left, but actually it is a dogleg right. Make sure your tee shot is on the left side of the fairway and you can make par here. #16 is just spectacular from the tee. The land gently curves to the left. 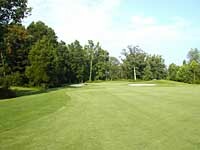 Mounding, trees and wetlands all steer your swing around the dogleg to a pretty green setting. #17 requires hitting a soft iron to a green that is 180 yards from the back tee. #18 has some real character. At 605 yards from the tips, only the " big hitters"can get home in two. Watch the right side for hidden trouble on your layup and you can play a short iron into this exciting finishing hole. 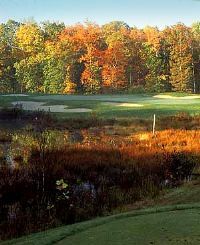 Call 540-891-0111 and make a tee time to play our historic layout !